Are Infant Halloween Costumes a Big Waste of Time? a Big Waste of Time? Photos like these come only once a lifetime. Here's the deal. Your baby isn't going to remember any of this. He's cute, but completely clueless. He may enjoy all the colors and pick up on the emotional excitement, but that's about it. Why go through the effort to create or purchase a costume? I've got two great reasons why infant Halloween costumes are well worth the bother. Just a Moment? Or a Memory? The more children I have, the more adamant I am about the necessity for infant Halloween costumes. The laughter heartily begins as we look back upon the memories captured in previous Halloweens, watching the costumes change year after year. as a black eyeliner nose and a pair of ears. There's Lauren, age 6, in her pink kimono. There's Elena, age 3, in her pink princess dress and wand. There's Isabella, age 10 months...in jeans? I don't think so. Try The Very Hungry Caterpillar. Parenting Truth #451: the more kids you graft into the family, the more little things naturally start slipping and the harder you have to work at capturing the little memories. I want Isabella to know that even when she was clueless we made an effort, on her behalf to include her in the things we were doing. That when we did things as a family, we did them as a family. I want her to share in the memories we're making, even if she can't appreciate them until later. You don't have to get all fancy-pants with your infant's costume. 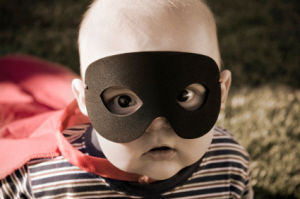 You can whip up some great Halloween baby costumes in 15 minutes or less at home. Since this year will pass A LOT faster than you anticipate, infant Halloween costumes are an ideal excuse to take some seriously amazing photographs of those chubby little cheeks. Pick out a Tom Arma original costume, flutter through some delicate fairy costumes, or transform him into wise Yoda. Then book an appointment with a professional photographer or call over a camera-obsessed friend. Some close friends of ours get the jump on the New Year's card every year by sending out a Halloween (or Thanksgiving) card instead. Frankly, this is just brilliant. It removes one more task from an already-stressfull holiday checklist. They dress up the whole family in a theme of costumes, take a photograph, and then send it, along with a yearly update letter to all their far-away-friends. It's gotten to the point that my kids (who haven't been able to meet them, since they're old college friends) look forward to seeing what they dressed up as every year. When we get down there next year on our way to Florida, my kids are looking forward to spending time with "their" Halloween friends (whom they've never actually met). Remove one more stress from the Holidays! Here are 30 theme ideas for your family. From a single parent and baby, to 5 kids or more. Now that I've demonstrated the value in capturing your child's first fleeting experience of Halloween, I'd be a bad friend for not offering some ideas on how to do it in a way that's worth doing. Some show you how to make, and some will show you how to buy. Here's to a fantastically fun Halloween! Halloween Articles You Don't Want to Miss!